Want to use the multiple Instgram accounts feature? In February 2016, Instagram announced a feature that made many users jump with joy. Instagram released a built-in feature which enabled users to add multiple Instagram accounts and alternate between them. Since owning multiple accounts on Instagram isn’t highly uncommon on Instagram, that the feature didn’t exist was a huge pain point for Instagram users, myself included. Chances are, you yourself have multiple Instagram accounts, and are working hard to juggle between them and find time to manage them properly. You might have one business account and one personal account for staying up-to-date with your friends and entertaining yourself. But before the multiple Instagram accounts feature, managing multiple Instagram accounts was even more frustrating. Every time you wanted to use an Instagram account, you had to log out from the account you were logged in to, and then log in to the account you wish to access, manually typing in username and password. Safe to say, this was a very frustrating process, which prevented you from sporadically looking at your Instagram accounts because you just didn’t want to log out and have to log in again with another account. 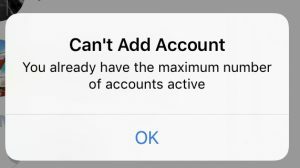 Having to log in and out from accounts on Instagram steals a lot of time. Lots of it. This is time which can be spent in a much better way. Considering the inefficiency of logging in and out from Instagram, If I’d tell you that there are still users who are logging in and out from their Instagram accounts because they just don’t know that the multiple Instagram accounts feature doesn’t exist? If you have multiple Instagram accounts but aren’t using the multiple accounts feature which enables you to effortlessly switch between accounts on Instagram, you’re missing out. Big time. In this article, you’ll learn how to add multiple accounts on Instagram, how to remove accounts, how to switch between them, and everything in between. The Multiple Instagram accounts feature enables you to add up to five Instagram accounts at one. You can log in to as little as one account, but you can also be logged in with five accounts at once. 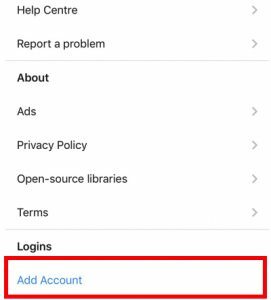 When you add multiple Instagram accounts, you can switch between them without having to hop between account by logging in and out all the time, having to manually type in username and password. Another huge benefit for the multiple accounts feature on Instagram is the fact that you have the possibility of getting notifications from all the accounts which you are logged in to. On Instagram, you could only be logged in to one account at a time before the update, and what this meant was that if you had notifications activated, you would only get them from one account, which meant risking missing important notifications from the accounts that you weren’t logged in to. Fortunately, that is no longer an issue since you can now be logged in with up to five accounts, and decide the notification settings for each of your Instagram accounts. 1. Go to your Instagram profile by tapping the icon in the bottom right corner. 2. Tap the cog-wheel icon situated to the right in your profile. The icon might also be three dots depending on which device you are using. 3. Scroll down until you see ”Add account”. Tap it. 4. Enter your username and password of the account you wish to add. 5. You’ve now logged in to your account. if you repeat the process again, but with a different account, you’ll be logged in to multiple accounts at once. There’s a second method to add multiple accounts on Instagram. 2. Tap your username at the top in the middle of your screen with the arrow pointing down. 4.Type in your Instagram account login details. Now, do note that the maximum number of accounts that you can be logged in to on Instagram at the same time is five. Therefore, if you perform the steps above but are already logged in to five accounts, you need to log out from one account before you can log in to a new one. Once you’ve logged in to multiple accounts, you’ll see your profile picture on different places throughout the app, for example when commenting on a post, and this is so you’ll always know which account you’re using, and aren’t logged in to an account and leaving comments or sending messages that were supposed to come from a completely different account. The whole point of the multiple Instagram accounts feature is to enable users to switch between accounts fast and effortlessly, and this is exactly what the feature does. If you want to remove an account from your list of accounts that you are logged in to, you can do so. Most people want to do this because they have reached their limit of five accounts, but others do it for other reasons. 3. Tap ”Log out of @youraccount”. Note that you get the option to log out of the account which you are currently logged in to. If you want to log out from a different account, select that account first, then follow the steps above. If you want to log out of all the accounts that you have logged in to at once, you can do so. Simple follow the steps above, and right below ”log out of @youraccount”, you’ll find ”log out of all accounts”. Tap that. Until February 18th, users who have managed multiple Instagram accounts – often a personal account and a business account, have been forced to consistently log in and out from their Instagram accounts when they want to do something, see what is going on, and check their notifications. This time-consuming and very frustrating task has for some, resulted in them turning to third-party Instagram apps which enables them to stay logged in to several accounts at the same time. Some people have even purchased multiple phones only in order to keep track of different Instagram accounts simultaneously. Since Instagram is especially against the use of most third-party apps as it both shows that Instagram’s own platform is missing something, and users have to turn to other tools to compensate for what Instagram is lacking. Also, Instagram obviously wants its users to be using the platform as much as possible, and if their users are using third-party apps it takes them away from the platform. Lastly, by adding a multiple Instagram accounts feature, Instagram indirectly encourages the use of several accounts. Of course, the more accounts you have on Instagram, the more likely you are to be spending more time on the platform. Furthermore, since many of the people who were struggling with logging in and out from their accounts were individuals who managed business accounts, Instagram wanted to encourage businesses on the platform, since, after all, that’s how they make their revenue. What do you think about the multiple Instagram accounts feature? Were you one of those who logged in and out from accounts before the new update?